Book three of the Courage, Love and the Meaning of Christmas series is finally complete! I finished writing it Saturday night, November 17, 2012 and it went live on Amazon.com Kindle Sunday morning. The print edition will be ready within a few days. This book was originally planned to be titled “A Fall from Heaven,” but as the story came together, The Art of Heart fit so much better. 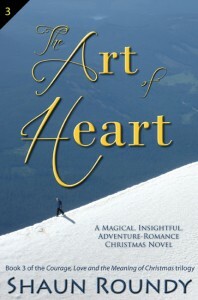 The Art of Heart brings an exciting and adventurous conclusion to Spencer’s quest for love, meaning, and happiness. A few days before Christmas, he gets a phone call that could change his life. The next day, he catches a plane to join an expedition up the tallest mountain in the continental US, but that’s not why he goes. He goes because, for the first time in a long time, he may get another shot at happiness. He goes because even a long shot is better than no shot at all. Never give up. From the highest of highs to the lowest lows, there is always hope. Just like with books 1 and 2, plenty of surprising plot twists, deep and useful insights made simple, lively dialogue, and engaging character arcs carry the reader through the story to its engaging conclusion.